Front-office system that allows you to organize the work of the cashier in shops with different forms of care, including self-service. Integrated with the accounting system TCU. It is a single module to work with commercial equipment. Identifies piece or weight item by barcode different standards from the manufacturer, either on its own barcode, or at barcode, printed out by weights. Keep records of funds for fiscal and non-fiscal booths of different outlets (PE and jur. 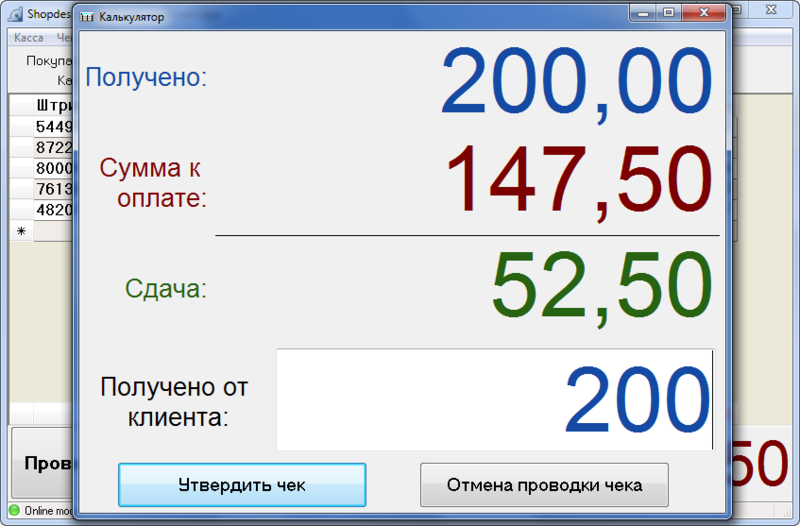 Persons) at a time (bring in, take-out funds, the proceeds). Imposes low requirements for wire-speed connection to the database (when using MSSQL Server 2005-2008), which allows you to organize the database connection via the Internet. In addition to all have the opportunity to work with a "slice" of the database in the absence of a permanent connection to the server. 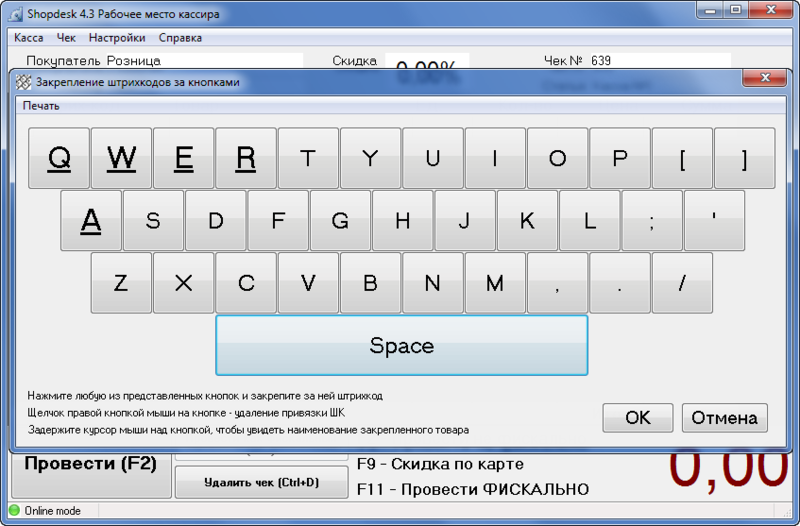 Supports fiscal registrars, working with discount cards, gives the X-and Z-reports. 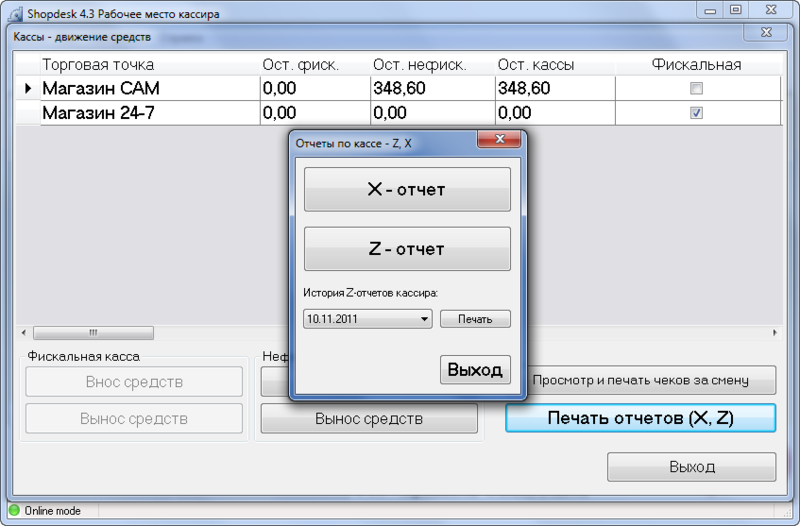 Allows you to flexibly configure the right teller, is a full log of actions. Has low hardware requirements, works with all types of scanners, supports a wide range of models check printers. Time to train the cashier kept to a minimum. 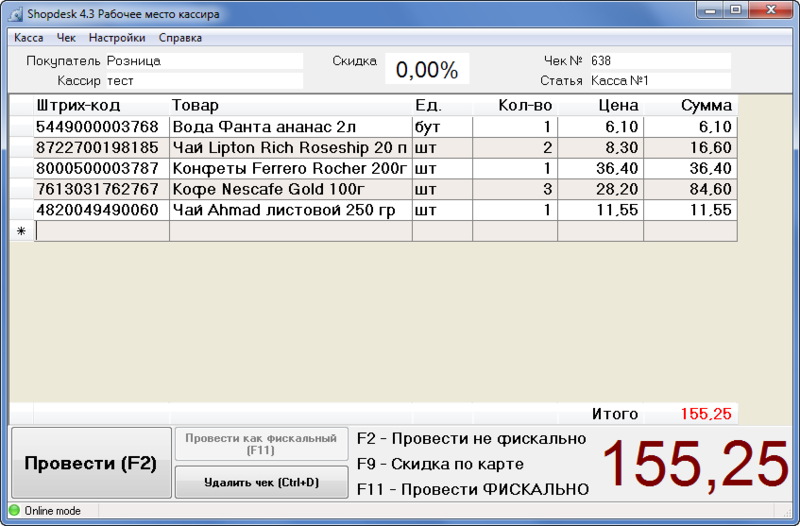 Architecture interaction cashier workplace Shopdesk with the main accounting system TCU described in the article Interaction ShopDesk, the trading server and TCU. User interface allows the cashier using the barcode scanner to identify the goods and enter it into check. For each scan the piece goods or the weight of the goods in check there is a new record with the number "1" for the piece goods. The cashier can edit this value, according to the actual quantity of goods. In the case of a commodity system with the weight on the bar code printed on the label weights determines the weight of the goods. Upon approval cashier check accepts payment from the buyer for the goods released and handed him a fiscal and (or) non-fiscal receipt. It works directly with the database, obtaining always the most current information available about the product and its price at the moment. Thanks to the "client-server" architecture, there is no need in any way concerned about synchronizing data back-office and front-office systems. If you change the values of any data front-office system begins to work with the new values immediately. For example, when approving the receipt of documents at the headquarters of operators working at TCU to changes in retail prices of goods on the shelf, same thing happens when approving the acts of revaluations, and change the retail price of the goods. Also with immediate effect, adjustment of data about the client (for example, the value of the discount, the permission/denial of service client), etc. 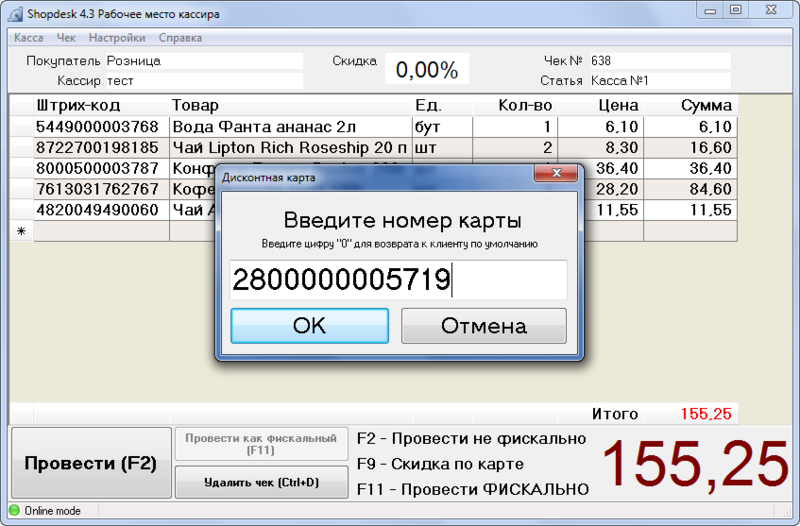 Addition, Shopdesk enables you to operate a workplace cashier even without any connection to the database, if you have previously made a backup of the database, which is a "slice" of data at a certain time. 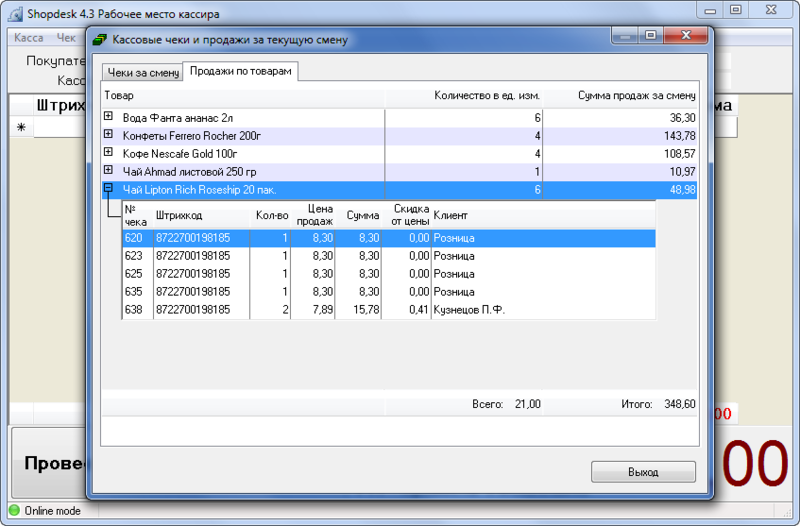 Such data may be prepared for Shopdesk or cashier manually or automatically on a schedule, when connected to the main database. More - the article Shopdesk work with primary and backup databases. Customer identification and receipt of accounting information system of the value of the discount if the customer has a discount card. Input goods in check by using a barcode scanner. Requires an unambiguous identification of the goods on its bar code. For the weight of goods to automatically extract information from the barcode on the weight of the goods. Counting the amount of payment and acceptance of a check from a client. Check printing. Providing real-time main accounting system on sales information. Multiple outlets simultaneously. Work with fiscal and non-fiscal outlets. Keeping cash on each outlet - to contribute to the cash register, counting revenues, removal of funds from the cash register. 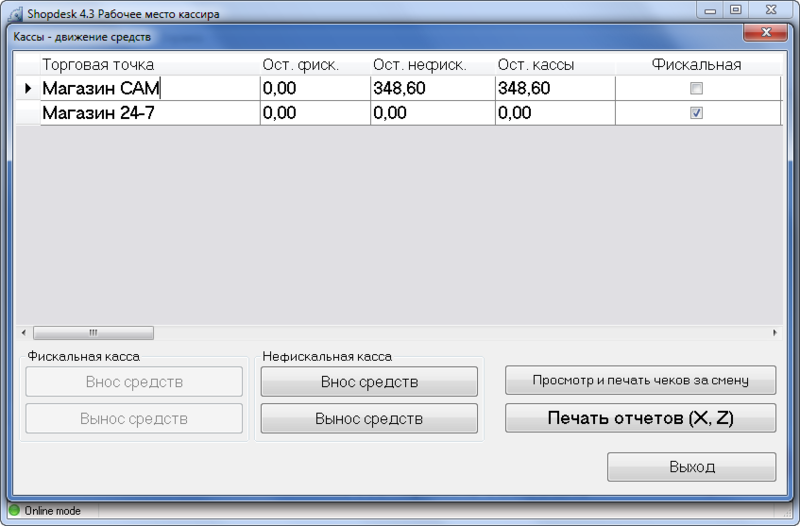 Providing cashier reports cash movements for change. View information about the goods sold for each check for a change. Please note - although full integration with the main accounting system TCU, a job is a cashier desk autonomously. In the late shift cashier is obliged to do X and Z-reports and submit them according to the cashier to the responsible person (senior clerk). In the back-office part of the (main accounting system TCU) the person in charge makes a counter-report on the sales of the cash working a shift. Do I have to say that the sales amount and the amount to be submitted to the cashier must be the same? Such a scheme is double-checking the cash register increases the degree of responsibility cashier. And also at the same time increases the reliability of accounting, not allowing the use of different schemes to trade goods in circumvention of the accounting system. In addition, also note that with proper verification is used to store checks of buyers at the outlet store for discrepancies in the inventory check and shopping. Is strongly recommended to read the article ShopDesk. Carrying out reconciliations of cash and closing shifts, which describes the proper organization and conduct of account reconciliations at the closing shift. Budget office computer, with support for LAN, with a monitor (preferably 15-inch LCD), a mouse, keyboard. RAM - 512 MB, Processor - 1.6 GHz, may INTEL and AMD. Operating system - Windows. Optimal use of laptops. Uninterruptible power supply at least 500 VA. It is strongly recommended that you use in conjunction with a voltage stabilizer. Barcode scanner. Are proven image-scanners, for example, PSC QS6500 or any other. If you plan to use the cash box, you can use embedded scanners. Printer non-fiscal receipts, for example, Lukhan LK-T21 (WTP-150), Epson TMT88, Samsung STP-103 and other check printing checks is optimized for wide 38mm, 50mm and 80mm. Desirable to choose a printer with auto cutter (Lukhan LK-T21). If a store is a tax, then print fiscal receipts required fiscal registrar. At the moment Shopdesk supports the following fiscal registrars: Mini PC, Mini FP.01, Mini-FP6, Mini-FP54, Datecs-FP3530T.